Until his recent retirement in 2012, Dr. David Redwine headed the world-renowned and award-winning Oregon Institute of Endometriosis at St. Charles Medical Center, Bend, Oregon, treating thousands of women with endometriosis from all across the US, Canada, and beyond. At school David was a keen athlete, excelling nationally in swimming and track, and ultimately winning himself a track scholarship to Stanford University, where he completed his undergraduate studies. Already as a young boy he clearly had a natural flare for science and knew that medicine was his calling. After Stanford, he embarked upon his medical degree at Baylor College of Medicine, in Texas, before moving to Oregon to complete his clinical rotations. He enjoyed all of the subspecialties but decided on gynecology because it "had it all": young and communicative patients who cared about their health, surgery, general medicine, and pediatrics. 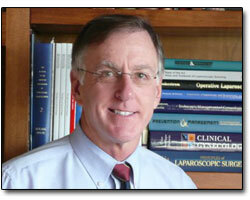 In 1978 he set up his private obstetrics and gynecology practice in Oregon. Endometriosis became a central part of his life because his first wife, Debra, was debilitated by this same very disease. They struggled to find effective treatment and experienced the same dismissal and misunderstanding at the hands of the medical community as so many others experience in their journey toward effective treatment. It was this personal experience that motivated him to try and do better for his patients. He set about learning all he could about the disease, documenting how it looked, how it behaved over time, and where it formed, and very quickly reached the conclusion that what he had been taught back in medical school had little bearing on the reality of what endometriosis really is and how it can best be treated. With the medical textbooks cast aside, he developed new concepts about the disease and about its effective treatment: the complete excision of all disease from the body. From his small practice in rural Bend his work and ideas slowly but surely began to draw the attention of the wider medical community, and today are recognized by the leaders in the field as representing the gold standard in the effective treatment of endometriosis. 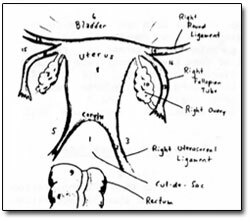 Dr. Redwine's notes on the pelvic mapping of endometriosis (1985). Some of his early clinical notes can be viewed here. Together with Nancy Petersen, R. N., who at that time worked as a nurse at the same hospital and who also suffered from endometrisois, the Oregon Institute of Endometriosis was founded in 1987 and Dr. Redwine began receiving patients from outside Oregon. By 1988 he was receiving such a volume of endometriosis patients that he decided to give up his obstetrics practice altogether in order to fully focus on treating women with this disease. The institute went on to receive world-wide acclaim. It was featured in Hospital Benchmarks, the newsletter of best practices, was listed among the top women's health programs in the nation by Self Magazine, and received an award for excellence from the National Association of Women's Health Professionals. During his career, Dr. Redwine went on to publish over 110 articles, monographs, editorial letters, book chapters, and books. He served on the editorial board for numerous scientific journals and was elected to various positions of responsibility on the boards of national and international laparoscopic and gynecologic organizations. He presented his work all around the globe, and during his travels was invited to perform surgery on some of the most challenging and complex cases of the disease. He also regularly received visiting surgeons at his practice in Bend who came from far and wide to watch and learn from his surgical techniques. While Dr. Redwine's approach was by no means radical, his results offered hope where often there was none. The foundation of his approach was simple: better identification of the manifestations of the disease and meticulous removal of all diseased tissue. The goal of Dr. Redwine's work was to safely and completely remove endometriosis from the body of each of his patients. In the vast majority of cases, this goal was met. The institute's long term research showed a recurrence rate of less than 19%, even at five years or more after surgery. The majority of patients were cured of their disease following a single surgery. Anyone who knows him will appreciate his wry and witty sense of humour, and his frightening intellect. His patients remember the warmth and kindness with which he treated them and their families during their stay in Bend. He was a truly dedicated doctor, doing all he could to provide each and every patient with as optimal an outcome as possible, taking as much time as needed to talk to and listen to them, and never giving up regardless of how demanding and complex their case. He still holds the record at St. Charles medical center for the longest surgery ever performed, spending a full 11 hours meticulously excising the disease from one of his patients. Dr. Redwine spent 35 years treating endometriosis, changing the lives of thousands of women, and inspiring other surgeons to continue his legacy by doing likewise. To find out more about Dr. Redwine's career and publications, download his curriculum vitae.